#occupy monsanto - we march on may 24th! October 2013 Detroit held its March Against Monsanto on the heels of a Pink walk/run. We started 3 blocks away from where that walk ended. As those who came out for a cure were leaving they saw us marching. Many questions were brought by those who had just walked their path toward a cure, raising money in that endeavor. 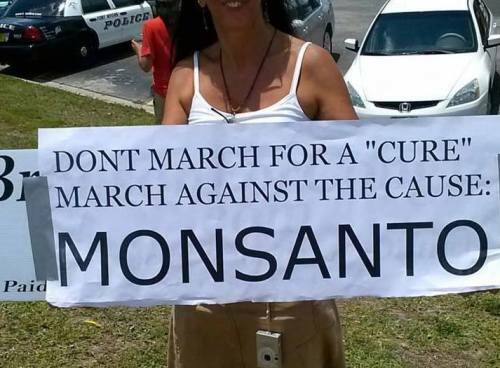 We told them this thing we were marching against is what creates the cancer, it is what makes us sick in many ways, it is unnatural and we are not informed of the dangers lurking in our food and in the medicines used to treat the illnesses that result. There are no warning labels and there should be. It took a battle to win warnings on cigarettes and removal of advertising. This battles against GMO (Genetically Modified Food) is that big, and more. It infests the things we need to eat, not just a dirty desire. May 24 #WaveOfAction #MAMdetroit walk with us for more than a cure. March against the cause of cancer.